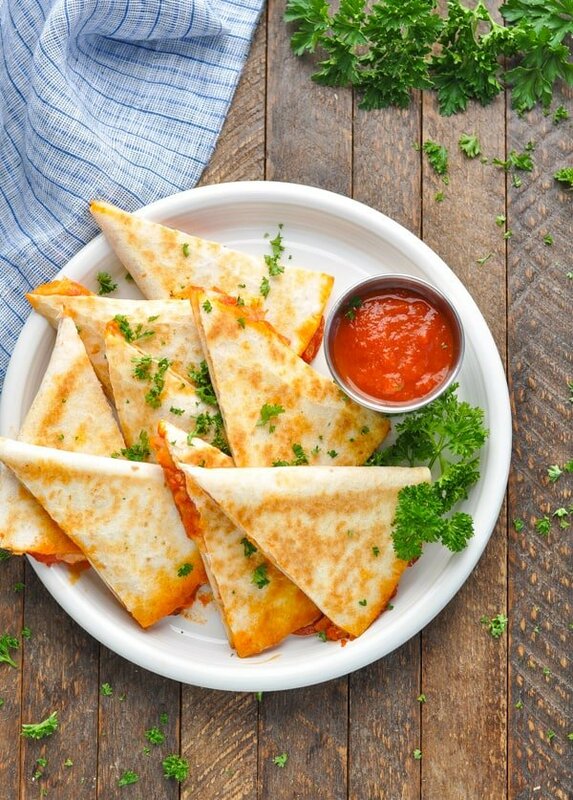 Easy and FAST, these Pizza Quesadillas are a healthy dinner that's ready in just 15 minutes! 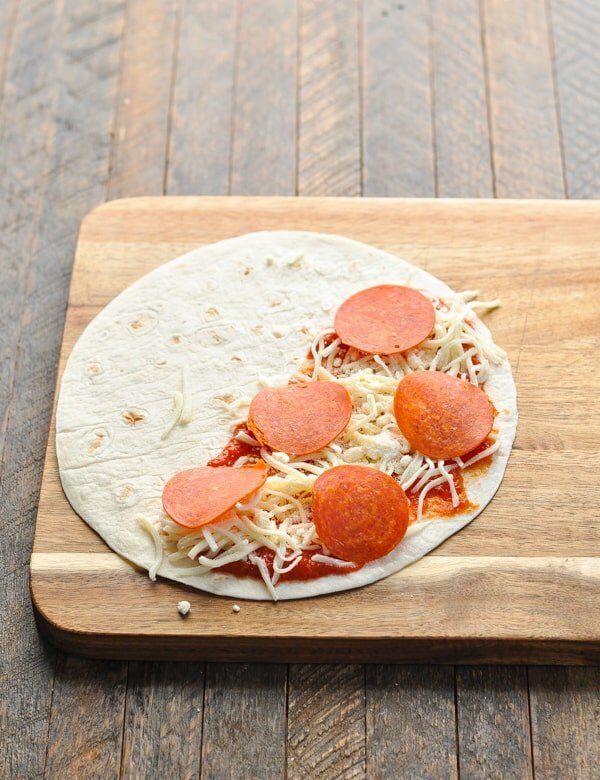 A kid favorite, the "pizzadillas" can be customized for each individual diner -- with just 3 basic ingredients! 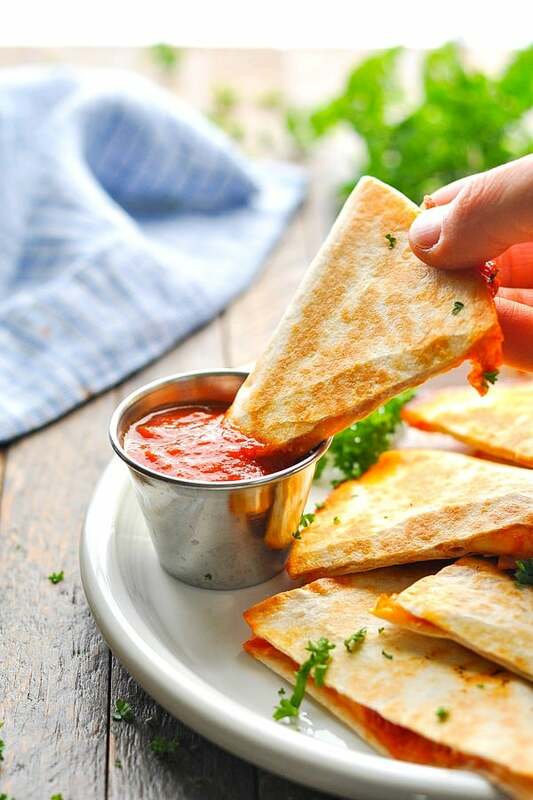 Easy and FAST, these Pizza Quesadillas are a healthy dinner that’s ready in just 15 minutes! 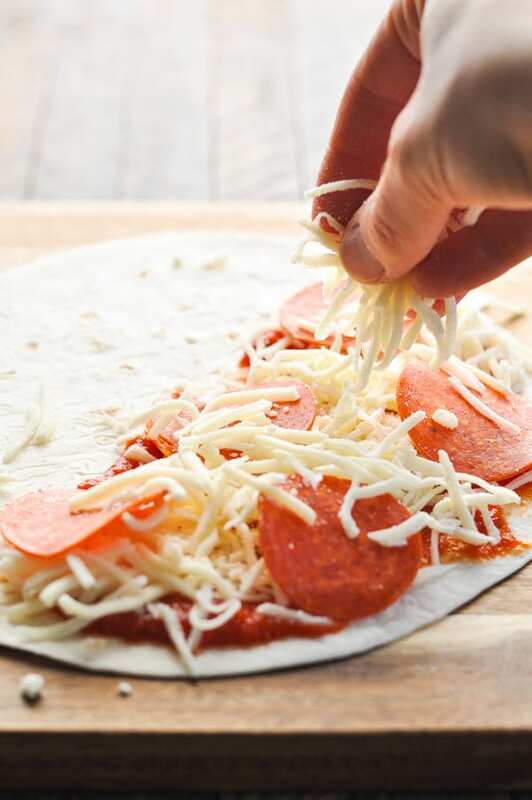 A kid favorite, the “pizzadillas” can be customized for each individual diner — keep them vegetarian, load them up with pepperoni, or make them simple and cheesy with just 3 basic ingredients! 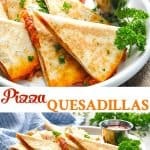 Two of my boys’ favorite meals are quesadillas and pizza (typical, right? ), so why not combine them? I told you this was kid-friendly! 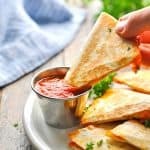 Since I almost always have mozzarella, marinara sauce, and tortillas in my pantry, these easy Pizza Quesadillas are a great last-minute lunch or dinner option that I don’t need to shop for. 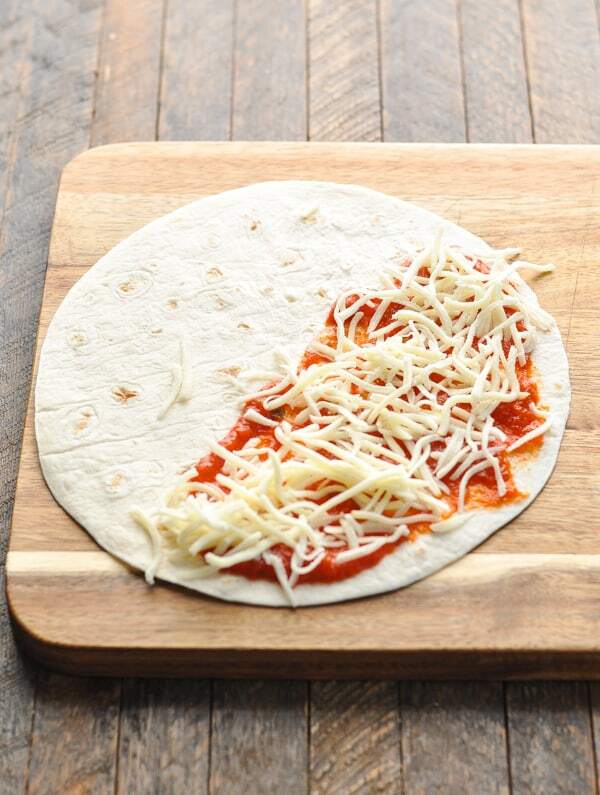 How do you make a Pizza Quesadilla? The base of this recipe requires just 3 ingredients: cheese, tortillas, and marinara sauce (or pizza sauce). You can add as many additional pizza “toppings” as you like, such as pepperoni, sausage or sautéed mushrooms and onions, but those extras are completely optional! First, spread marinara sauce on half of a tortilla. and fold the tortilla over. 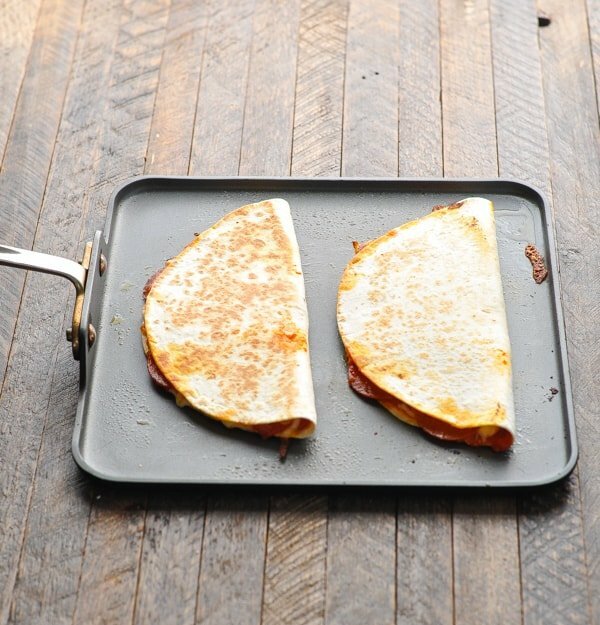 Cook the quesadilla on a griddle (or in a large skillet) for about 2-3 minutes per side, or until browned and crispy! Remove to a cutting board, allow to cool for a few minutes, and then slice into triangles and serve. How do you make quesadillas in the microwave? Assemble the quesadilla as instructed. Place on a microwave-safe plate and cook on HIGH until the cheese is melted (about 1 minute). How do you make pizza quesadillas in the oven? Assemble the quesadilla as instructed. Place on a baking sheet that has been sprayed with cooking spray. Spritz the top of the quesadilla with olive oil or cooking spray (this will help it get crispy and golden brown in the oven). Bake the quesadilla at 450 degrees F for about 10 minutes, or until cheese is melted and tortilla is golden brown. 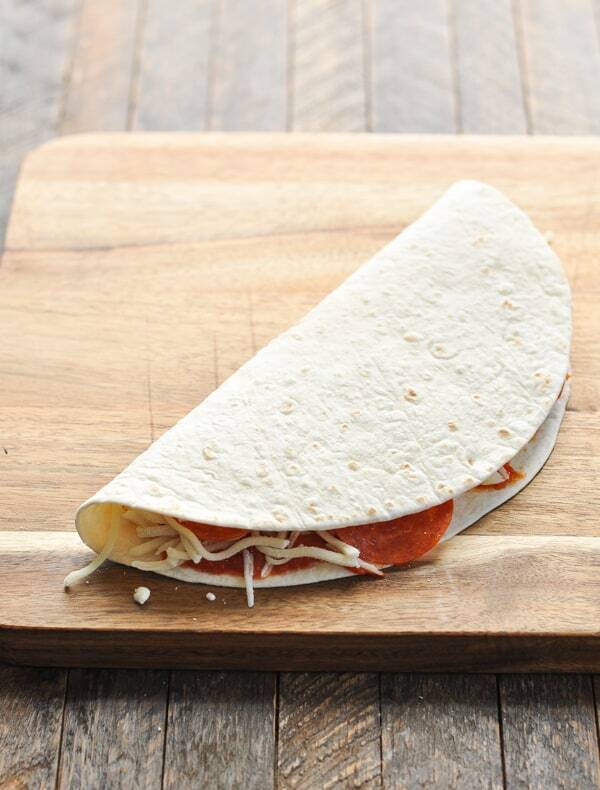 Make healthy pizza quesadillas by using wholegrain tortillas, reduced fat cheese, and plenty of fresh vegetables! 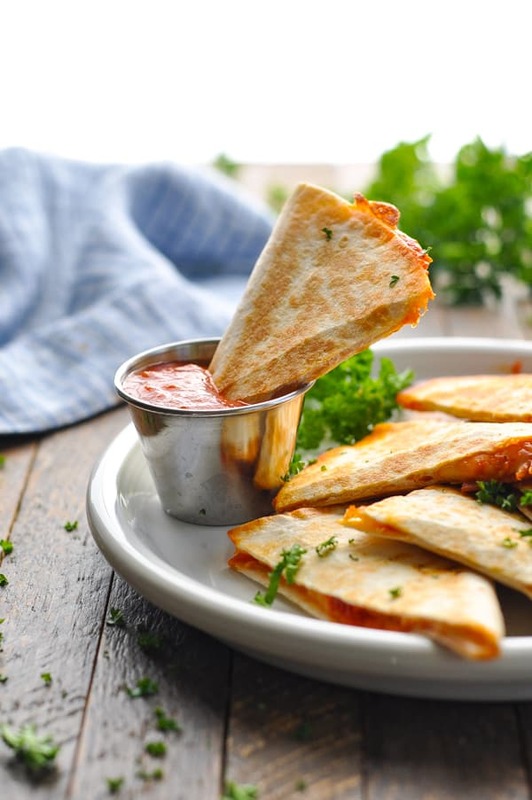 Prepare vegetarian pizza quesadillas by omitting pepperoni, sausage and other meats. Stuff plenty of sautéed veggies into the quesadillas so that they’re satisfying and flavorful! 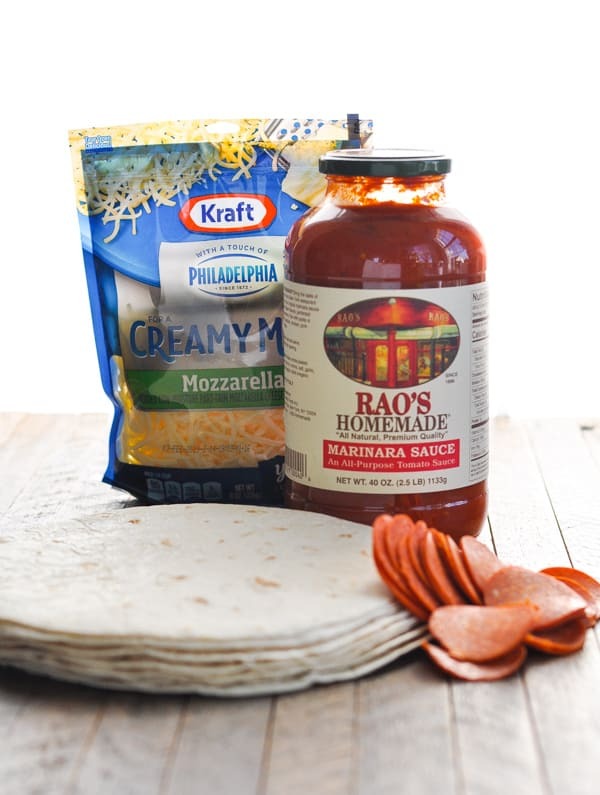 Make pepperoni pizza quesadillas (as shown here) using a few slices of pepperoni and a sprinkling of grated Parmesan cheese! This recipe yields 1 quesadilla, but you can easily double, triple or quadruple the ingredients to feed a family. Try cooking with kids! This is an easy way to let your little ones help in the kitchen. 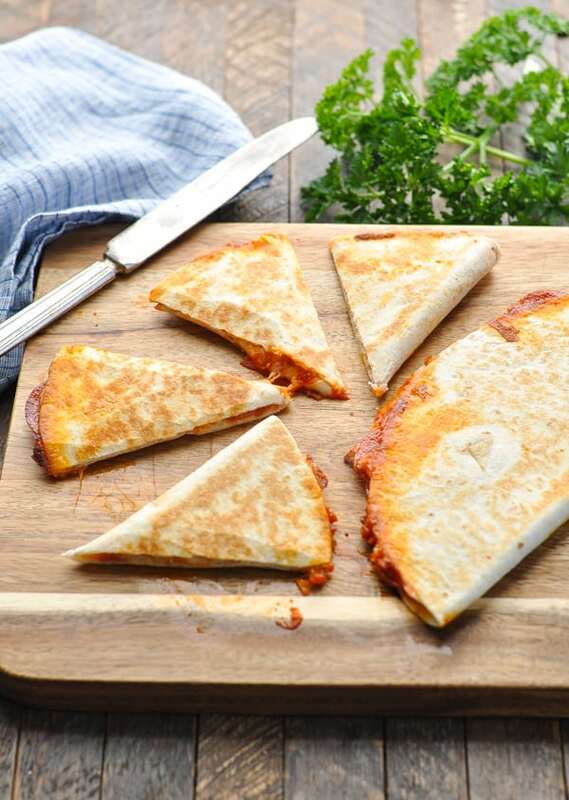 Allow the children to assemble their own quesadillas by adding the toppings of their choice. Preheat a flat griddle or a large skillet over medium heat. 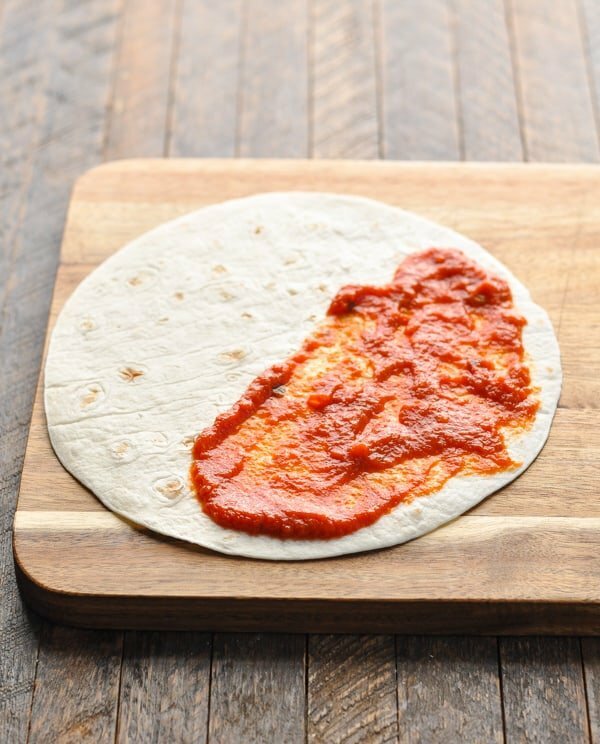 Spread marinara sauce on half of the tortilla. 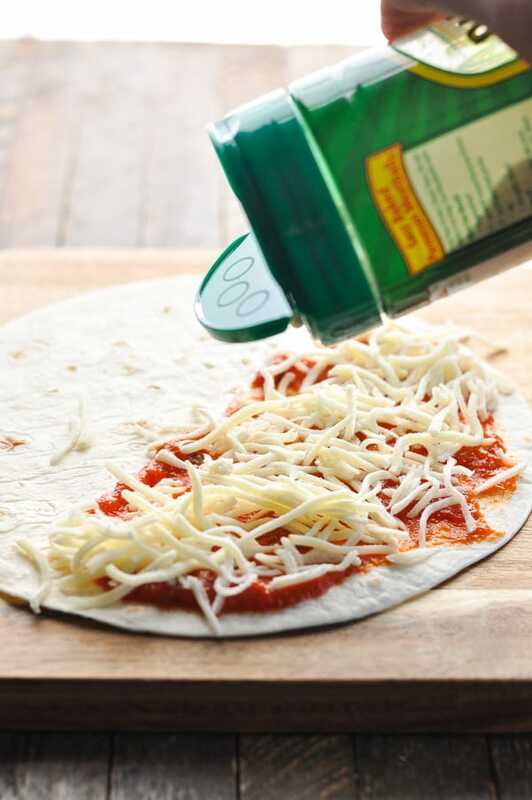 Sprinkle with shredded mozzarella cheese, and any other toppings of your choice. Add another layer of mozzarella over toppings. Spray griddle with cooking spray and cook quesadilla for 2-3 minutes per side, or until browned. Remove to a cutting board and allow the quesadilla to cool for a few minutes. Cut into triangles and serve. 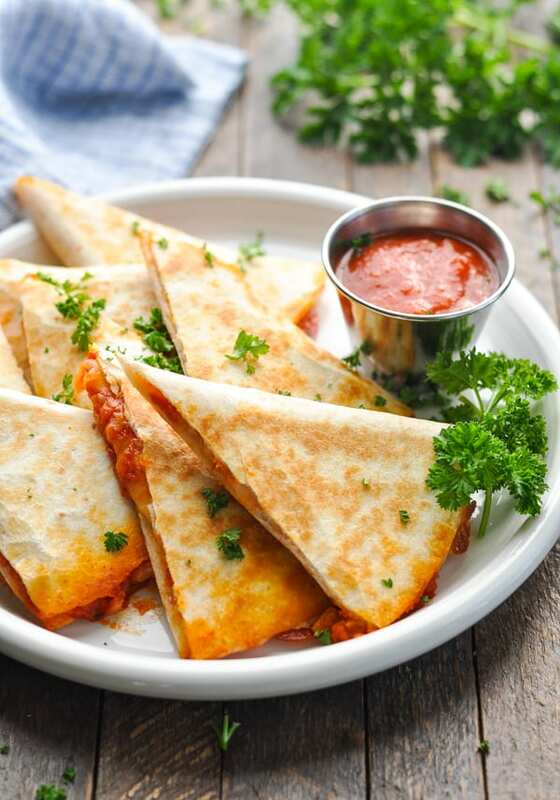 Prepare vegetarian pizza quesadillas by omitting pepperoni, sausage and other meats. Stuff plenty of sautéed veggies into the quesadillas so that they're satisfying and flavorful! This post was originally published in March, 2014. It was updated in January, 2019.